Duffield Cemetery contains 9 burials from the First and Second World Wars. We are extremely grateful to Richard Roberts (<richard.nsw@googlemail.com>) ) who has forwarded the photograph of Private Wingfield Land's grave in this cemetery. Details of Private Land are below this photo. Richard Clarke of the Derby and Derbyshire War memorials Project (http://derbyshirewarmemorials.wikispaces.com/Milford) has forwarded the following information on Private Land. Private Winfield Land. 237541. 692nd Agricultural Company, Labour Corps, formerly 57149, 2nd/4th Battalion, Yorkshire Regiment. Son of Jedidiah and Sarah Ann Land; husband of Susan Land, of 1, Wood Lane, Sunny Hill, Milford, Derby. Died at home 23 November 1918. Aged 39. 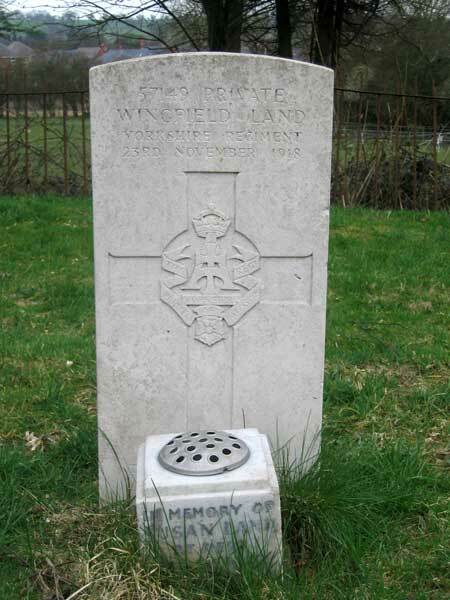 Note : In the CWGC he is shown as Wingfield Land, but does not appear in SDGW.